Is Your Cat Really a Finicky Eater? Maybe Not. 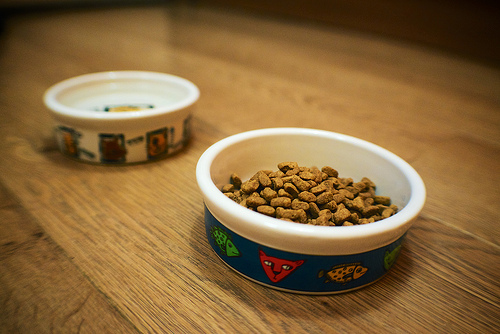 Cats can refuse to eat or leave portions of food untouched. Find out the reasons why (or why not) your cat is a fussy eater. Throw the toilet paper in the cart; slam-dunk the paper towel in the basket; round stacks of cranberry sauce at the speed of light; get that hospital shopping list done! Shield my eyes from the 2-for-1 offers on Cherry Jubilee and Rocky Road, I am almost at the finish line! Whoops! I forgot the kitty litter. Three-point turn into pet food aisle. Meet a client caught red-handed buying Tuna Surprise Crappos. She asks my advice on grilled or classic, Sheba or Fancy Feast, gravy or no gravy? Wait a minute, am I back in the office? I hear that remark day in and day out, in one cat appointment after another. People and their finicky cats. I could speak volumes about this problem — that’s why this article is so long. Keep reading for tons of helpful advice. 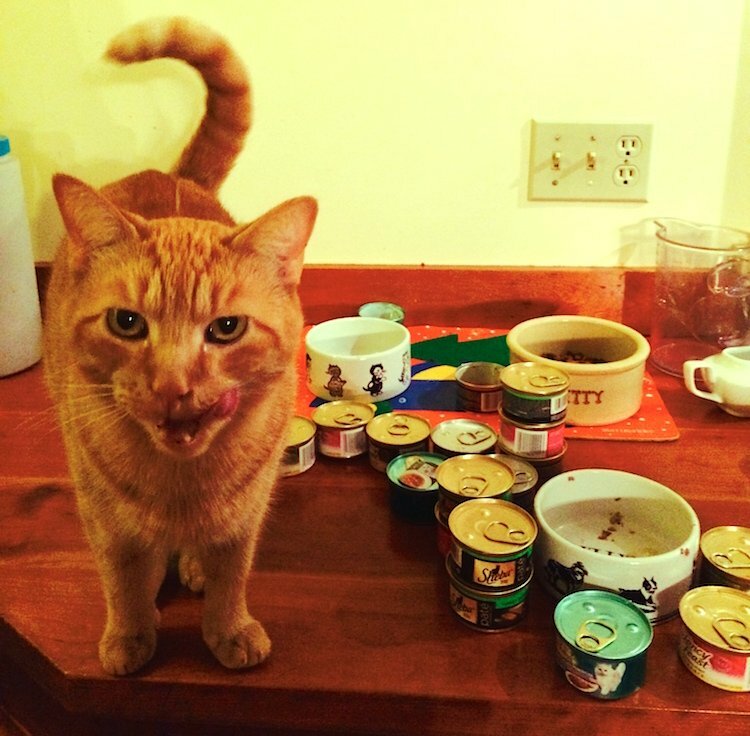 Feeding your finicky cat can be an emotional nightmare. You can feel worry, resentment and even some anger. I mean, if there are so many choices in this consumer-driven world of ours, why can’t you find the one thing your cat will eat? The solution is actually part of the problem, and the problem has been created by the pet food industry. The solution lies with us, the consumer. Those millions of choices on the supermarket shelf are marketed to us, not your cat. By getting caught up in the frenzy of trying to be Top Chef to your cat, you can create a problem-eater. For the most part, finicky cats are not born. They are created. BY US! Many Americans overfeed dry food or open up a new can every time their cat walks into the kitchen. And we feed too much of that bag or that can. Cats shouldn’t eat that way. Feral cats stalk, kill and eat small prey 8 or 9 times a day. Now compare that to your house cat, who leaves the couch 8 times a day to eat his entire daily ration of dry junk food at an open trough. He’s eating 8 times his daily requirement of fatty, unhealthy food. And the walk back to the couch from the kitchen? It’s not a big calorie-burner. In the list of phrases I hate to hear from cat people, this tops the list. Cats who are addicted to low-end dry food can be the biggest challenges. If they’ve never been exposed to good canned food or even high-end dry food, they may hold out at all cost for their flavor-enhanced, animal digest–sprayed pieces of yellow, brown and orange JUNK. They aren’t “finicky,” per se. They are simply used to eating Kitty Fritos. This is sadly akin to a child diet of fast food and potato chips. If your kids eat chicken nuggets and French fries, offering them a diet of high-quality protein and vegetables is not going to be easy. This is the second worst phrase someone with a cat can admit. Besides trying to change their diet, cats conditioned to the never-ending dry buffet are at risk for developing obesity, urinary problems and kidney failure, to name just a few of the top feline health risks by a dry food diet. It would be like a human moving his recliner to a Las Vegas buffet. The biggest way to avoid this nightmare is to never feed dry food only in the first place. But this is easier said than done, particularly when many cats are inherited or adopted with strong food preferences in place. Many feline practitioners wish all kittens and new adoptions were fed a canned food diet exclusively (home-cooked and raw diets fit into this category with some qualifications). This canned diet should consist of various flavors and textures. If your cat has an intense desire to eat only fish or only shredded, for example, try to break this habit before it’s an embedded food preference. It’s much easier to transition your cat to a well-rounded or special diet if necessary if he’s not addicted to a solitary food or flavor. Is Your Cat Really Finicky? At least 10 times a week someone tells me their cat “is finicky.” Then I make eye contact with the 15-pound tub of lard-puss on my exam table. Clearly, many people think their cat is finicky because Mr. Tubby leaves some food behind on occasion or doesn’t dive into the new can of shredded morsels of gravy-laden poultry bits and tuna flakes on a bed of Florentine spinach with egg. Tubby is probably saying to you he doesn’t feel like the brunch menu right now mixed in with his charcuterie. Or, more likely, Tubs ate plenty 2 hours ago and he just isn’t hungry. He doesn’t care that you spent $1.29 on 3 ounces of cat food. Okay, humans, is your cat really skinny or are you just channeling your misplaced jealousy of your girlfriend who has been a size 2 since high school? Does your cat eat every day? If the answer is YES, your cat is probably fine. Is your cat’s weight stable? If YES, your cat is probably fine. Is your cat acting normal, with good energy for her stage in life? If YES, your cat is probably fine. One of the most important parts of your cat’s annual checkup is a record of her weight. But if it isn’t time for a visit and you are concerned about weight loss or gain, just bring your cat to your vet and have a tech weigh and compare the weights on the chart. This is a free service. You know, cats are like people. We don’t all fit into that size 2. Nor are we all size 18s. There is a huge variety of cat body types, cat metabolism, caloric needs and lifestyle. Seriously, when you ask yourself if you just need to eat less, eat better or just go to the gym, ask Fluffmuff on the couch the same questions. Weight trends and body condition score are more important than actual weight in many cases. Again, this is where your vet should have this important info stored in your kitty’s record. By now, I hope you’ve thought about how you feed your cat, if he is skinny or overweight and if he is truly “finicky” or just addicted to a dry diet. Keep reading, because next I offer some suggestions on how to tempt a truly finicky cat and how to get your dry food junkie into rehab to get over his addiction. The truly finicky cat tests your patience and makes you open up more cans of food than seems humanly possible. This seems wasteful, as it should. What to do with all those opened, licked but not eaten cans? Put them in the refrigerator and try again later? Fat chance. Unlike me, cats don’t see see the virtue in leftovers. Even microwaving a refrigerated can of cat food does nothing for most cats, and leaves your house smelling like old meat compost. If you are worried about your cat’s appetite, bring this problem up with your vet to make sure your cat is just finicky and not sick. Weight loss or GI symptoms can mean there’s more to this than being picky. As I mentioned earlier, if your cat eats every day and maintains a decent weight, chances are he’s okay and may just not be turned on by food. They can be social eaters or need total seclusion. They can have intense food preferences or eat anything you offer, including dog food. Many cats like to stick with the familiar. They can be afraid to try new things, so buying and offering a vast majority of foods may be enforcing rather than solving the problem of the finicky eater. Introducing a healthier diet or trying to find something your cat “likes” takes time and patience. Most finicky eaters eat enough dry food or one canned food to get by. The goal is to broaden the finicky cat’s horizons with a healthier diet and to get the dry-food addicts off the stuff. The protein is more plant-based than animal-based. Water content is too low. Even if the dry food induces your cat to drink a lot of water, it’s not sufficient. You may think your cat should eat more than she actually needs. Most Americans believe the ideal body weight for a cat is actually an overweight cat. Our culture is killing its cats with too much food. It may not be the food at all that’s keeping Freddie from the food bowl. Something may have scared Fred when a particular food was served. Unbeknownst to you, there might be certain flavors or textures that have confused him or made a variety of foods undesirable. Has anything changed in your house, like a new cat, a new puppy or even a new bowl? Cats can have compulsions about food and food aversions just like people. Fred may just want his old bowl back or his old feeding station returned, particularly if his food was moved to make room for a dog or a baby or another cat. Cats prefer their own bowl. 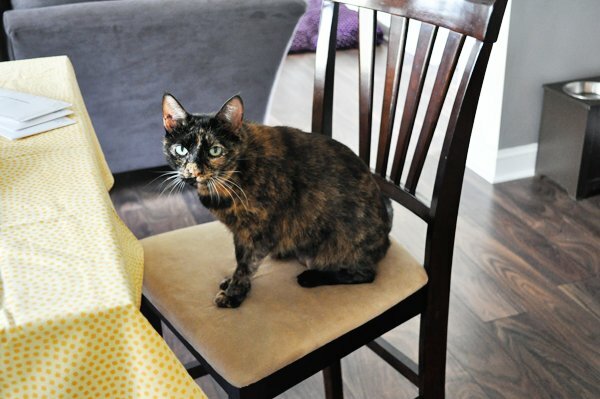 They may even prefer their very own place at the table, far away from any other cats in the house. Cats who want total privacy when eating present a particular but not insurmountable challenge. Recognizing your cat’s peculiar eating behaviors is half the battle. Then you can move on to his food preferences. This is not funny. A subset of cats will test your patience to the max and stop eating for days if you don’t give them what they want. If they are truly on a hunger strike, you need to get them to eat. Cats can develop a fatty liver syndrome called hepatic lipidosis, caused by starvation. Obese cats are more at risk. Cats should not go more than 24 hours without eating. If your cat has not eaten for more than 24 hours because he is sick or acting sick, please bring him to your veterinarian. But if he is not eating because you are trying to change his diet or offering him a healthier diet, you need to break down and give him a little of what he wants after 24 hours. 1. Making your finicky cat hungry really helps. Stop free-feeding. 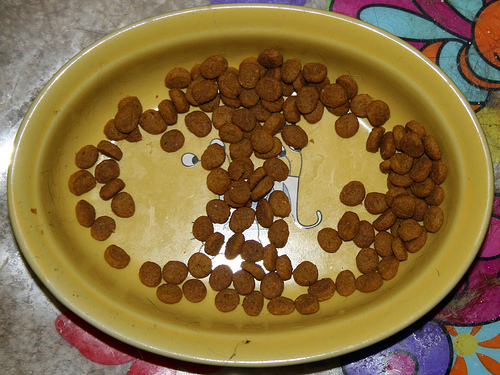 Remember the never-empty dry food bowl? Get rid of it. All day long while you’re at work, let Cat-brat get really hungry. She can’t make you feel guilty if you’re not home. Natural hunger can work in your favor. 2. Establish a feeding schedule. If your cat has been eating free-choice, begin feeding 2 meals a day. Most cats are hungry after not eating for 12 hours. They should dive into the first thing you put down after a 12-hour fast, which should be a small portion of healthy canned cat food. Real hunger is a stimulant! 3. Play with your cat before feeding times. Get the little bouncy ball or his favorite tassle-chasing toy. Exercise stimulates appetite. Get that cat a gym membership! If you are losing patience and your cat is resistant to canned food, throw 8–10 pieces of dry food around the kitchen to stimulate activity and hunger, and then try a portion of canned food again. 5. Dry food, particularly the low-end stuff, is like a drug. Cats can smell their Friskies crack in the cupboard. If you are transitioning your cat from dry to canned, or trying to feed a better quality dry food for that matter, keep the dry food in the fridge where they can’t smell it. Better yet, put it outside. If your cat can smell their dry food anywhere in the kitchen, they might hold out for it. 6. 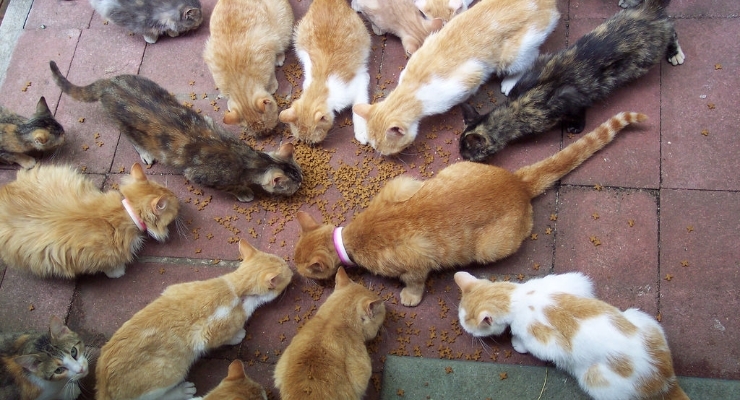 Cats are often social eaters and like to eat with you. “Feed me” equals “pet me.” I have been known to be over at the hospital at 3 a.m. offering some yummy morsels to an anorexic patient while petting him in the total quiet of the night with no distractions. My heart takes huge leaps when the cat first responds to the beauty of touching and rubbing — and then eats his food. 7. For hunger strikers, sprinkle a tiny amount of tuna or chicken on the food. If they love this, begin to press this highly desired food into the canned cat food. If they are still maniacal about eating dry food, dip some pieces of dry food into tuna juice and see if they begin to get the idea. 8. Raw meat, baby food or deli meats are appealing to certain cats. Follow safety protocols when it comes to raw meat. These foods also get the cat away from the “crunch” sensation of the dry food. We, as humans, should understand this. The sensation of a crunching potato chip or the smell of a Frito is addictive for some of us! 9. Parmesan cheese sprinkle works for many cats. Yes, the stuff in the green can. Sprinkle on top of the food you want them to eat. 10. FortiFlora (a probiotic) is intensely attractive to some cats. Sprinkle just 1/4 or less of a package on top of a meal. 11. Moistening wet food is an option, but it can be a health hazard. Discard after 20 minutes. Dry food is very high in bacteria and mold. Wetting it promotes mycotoxins and aflatoxins. This is a recommendation with safety reservations. The same goes for mixing in canned with dry food. This should not be left out for longer than 20-30 minutes. 12. Supermarket and lower-end canned cat foods are still much better than a dry diet. If your cat likes a 9Lives or Friskies canned food, for example, you have already won a big part of the battle. You can begin to mix in a better canned food or a prescription diet in with the popular brand if necessary. This often works. There’s a lot more info on transitioning the hard-core dry food addict or feeding the sick cat, but I’ve gone on long enough for one article. 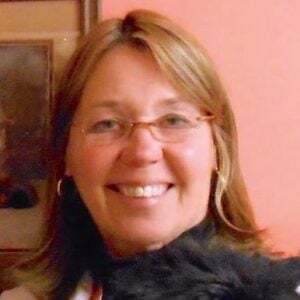 I have borrowed heavily from information found at a great website — catinfo.org — by Dr. Lisa A. Pierson, DVM, who is really dedicated to feeding cats a healthy diet. Please visit her site. Just remember that your cats are individuals. My house has been inhabited by obese-buds, skinny-minnies, piggy-wiggies and finicky-wicketies. Cats have lots of food issues, just like your friends and kids. The key is finding out what works and what keeps them healthy. I remember when my kids wanted to eat frozen pizza and tater tots, and I felt like the worst mother in the world. Now they’re eating kale and Swiss chard. YEAH!